Last week, California Governor Jerry Brown signed into law a bill that would automatically register eligible citizens to vote when they interacted with the DMV. This is the second such law, following Oregon’s pioneering law earlier this year. As Liz Kennedy, a counsel at Demos, argues, these laws are crucial because they shift “the burden of voter registration from the individual to the state.” I’ve previously argued that automatic voter registration would dramatically change American politics, and two policies that are set to be major issues in 2016 explain why. 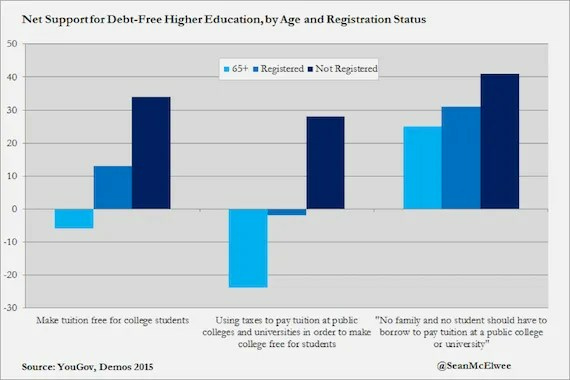 Debt-free college is one of those issues, with support breaking down along registration lines — unsurprising since low-income people, young people and non-white people, who are most likely to support the policies, are least likely to be registered. Peter Moore, an assistant editor at YouGov, an international market research firm, was kind enough to give me data about registration status from a YouGov survey focused on debt-free college. The chart below shows net support (support minus oppose)* for registered voters, non-registered voters and individuals over 65. As the chart shows, older people are most likely to oppose debt-free higher education, and non-registered people support debt-free higher education more than registered people do. *On the three question examined, YouGov had 5 categories: Favor/Oppose (or Agree/Disagree) Strongly and Favor/Oppose Somewhat. I collapsed into two categories (Favor/Oppose). Why does this matter? Brian Schaffner, Professor of Political Science at UMass-Amherst tells me that his Cooperative Congressional Election Study data show that the median age of voters in 2012 was 51, while the median age of nonvoters was 42. In another dataset, the American National Election Studies 2012 survey, only 5.8 percent of those between 17-34 donated to a campaign, compared to 20.6 percent of those over the age of 65, suggesting that both voters and donors are older than the population at large. To see how low turnout among youth affects politician’s incentives, I ran a simple analysis of the 2014 Census Bureau turnout data. I calculated the share of the electorate that was between 18-24 and 25-34 in 2014: 5 percent and 11 percent respectively. Then I calculated what the youth share of the vote would be if youth voted at the same rate as individuals older than 65: 13 percent and 17 percent, respectively. 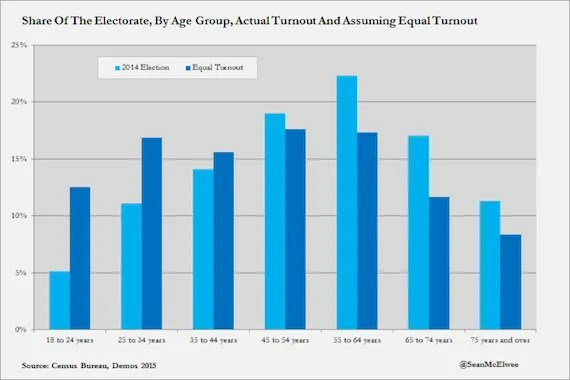 In 2014, only 16 percent of voters were under the age of 34, in an equal turnout scenario, 29 percent would have been. The chart below shows the stark change between the projection and reality. My recent report “Why Voting Matters” brings in an extensive political science literature to show that politicians respond to voters, and that boosting turnout is one way to get more responsive government. It’s clear that in the status quo, politicians have overwhelming incentives to respond to the preferences of older Americans. That could slow progress towards debt-free higher education. There’s another deep bias in the electorate: this one by class. People in families earning less than $50,000 made up 38 percent of the electorate in 2014 — in an equal turnout scenario, they would have made up 46 percent of the electorate. What might that mean for policy? YouGov was kind enough to share their data on another key question: the $15 dollar minimum wage. Already, organizing by fast-food workers and OUR Walmart has brought the issue to the forefront of the public debate. 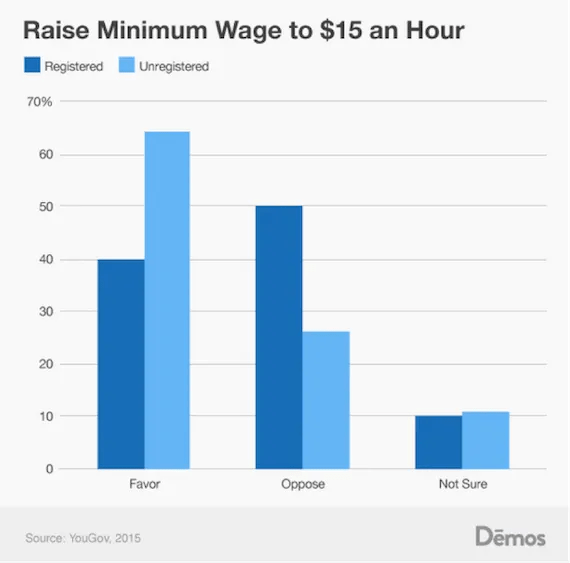 Could higher turnout push politicians to adopt a higher minimum wage? The data suggest is rather stunning: While registered Americans on net oppose a $15 minimum wage (40 percent in support, 50 percent opposed), unregistered Americans overwhelmingly support a higher minimum wage by a large margin (64 percent in favor and 26 percent opposed). These results have strong support in the academic literature. For instance, as I noted recently, a study by Ryan Enos, Anthony Fowler and Lynn Vavreck finds that a one standard deviation increase in the propensity to vote (15 percentage point increase in the chances of voting) is correlated with a $6,000 increase in family income and a 4 point decrease in support for a higher minimum wage. Political scientist William Franko finds that high levels of participation inequality (the rich voting more than the poor) leads to lower minimum wage rates and less generous welfare programs. Other recent work by Franko with political scientists Christopher Witko and Nathan Kelly, as well as independent work by James Avery, corroborate this finding. 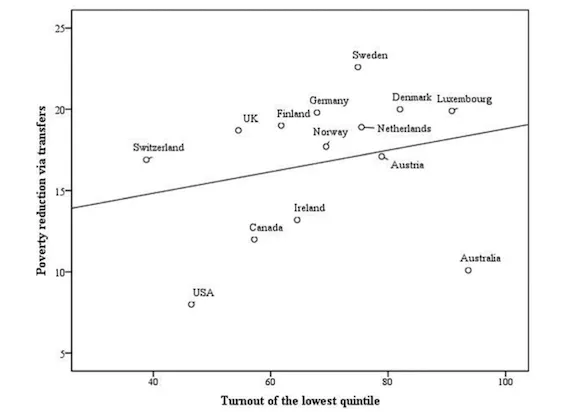 In a study of 14 countries, Vincent A. Mahler, David K. Jesuit and Piotr R. Paradowski find that higher turnout among the poor leads to more poverty reduction via government transfers. Some commentators argue that those who currently don’t vote are too ignorant to exercise their right — but studies show that when people are encouraged to vote, they are more likely to pay attention to elections. By boosting low-income turnout we could make politicians would have to begin addressing issues that are important for low-income, young and non-white Americans, particularly economic issues. Automatic registration at the DMV could bring millions of new Americans onto the voting rolls, making it easier for them to vote but also making them targets for get-out-the-vote operations. As I’ve noted, there is a deep mobilization gap, with parties more likely to mobilize richer voters. Automatic voter registration could solve that. For my report, Christopher Mann, professor of political science and Director of LSU’s Academy of Applied Politics, told me that it is “unequivocally” true that same-day registration “makes more low-income people targets for GOTV.” The effect of an even more powerful reform like AVR would likely be even stronger. In the status quo, politicians are overwhelmingly responsive to donors. But with higher turnout, catering only to the donor class could threaten their seat. Automatic registration could serve to alleviate the power of the donor class, and is the first step towards bringing America closer to its democratic ideal. It could release a democratic revolution. This entry was posted in Voting on February 14, 2016 by seanadrianmc@gmail.com.